Back in early 2006, we were contacted by Marlee Ranacher from Bullo River Station about their freshwater crocodiles. Not any old freshwater crocodiles, however, these were pygmy freshwater crocodiles. These tiny bundles of attitude are essentially very similar to freshwater crocodiles (Crocodylus johnstoni) but they live in far upstream escarpment areas around the Northern Territory in particular. In these areas there is very little food, mostly various species of small fish no more than a couple of inches in length, small crustaceans and... well, that's about it. As a result of not having much food available, they don't grow very large. They are essentially stunted crocodiles, but they have adapted to this unique environment. And, more importantly, they are essentially geographically isolated from downstream, "normal" freshwater crocodile populations. That in itself makes them interesting, but they have the potential to be even more interesting. If they are geographically isolated and there is little or no genetic input from more downstream populations, then they have the potential to become genetically distinct over many generations. It's evolution at work. One tantalising clue comes from a breeding pair of these tiny crocodiles, originally from the upstream Liverpool River, that were bred by Melbourne Zoo. The offspring were fed a normal captive diet, and therefore they should have grown into normal freshwater crocodiles. However, they did not - they were also stunted. Although that doesn't prove anything, it makes enquiring minds want to know whether they are indeed different. There is another spanner in the works. Cane toads! These warty horrors can get into the most amazing places, and that includes upstream freshwater escarpments. We already know that freshwater crocodiles eat cane toads, and that they are susceptible to their toxin, and a recent study showed a 70% decline in crocodile populations before and after cane toad arrival. Pygmy crocodiles, being smaller, are more susceptible to the toxins from these toads, and therefore we are all extremely concerned about the long-term impact of toads on these pygmy populations. So we are here at Bullo River conducting surveys and to collect tissue samples from a representative sample of crocodiles. The surveys involve walking along an upstream creek during the day, mainly to find pools and to figure out how to climb between them - some areas are quite treacherous to get around - and then walking back at night with a headtorch and spotlight to count the number of eyeshines in each pool. Crocodiles have a reflective layer in the retina of their eyes, and the reflected light is bright red so they are quite easy to see at night if they are on the surface. The problem is, many crocodiles are not on the surface - usually they're hiding amongst vegetation, under logs, and particularly in cracks between submerged rocks. So you really have to spend a lot of time looking around, double and triple checking each pool. Catching them to take a tissue sample is another challenge. The best, and perhaps only effective way of doing it is to get into the water and catch them by hand. Most of the time this isn't a problem because they're fairly small, although trying to hand-catch a 1.5 metre crocodile (the biggest any pygmy croc appears to get) requires a bit of care! Many of the crocodiles are also very naive towards people and will happily swim over to check you out. Some of the larger, territorial males aren't best pleased by your presence either. Once captured, however, they become quite placid and can be measured and photographed with ease. We take a small sample of tissue from the tail, basically a piece of mostly dried skin, and then release the crocodile back into its pool where it glowers at us. If only we could tell them that it's all in their best interests. We're here for a few more days yet and we've seen some pretty amazing creatures up here, so there'll be more to come. Are you taking the tissue samples for sequencing? Do you have any idea of the population size? What's the extent of their geographical distribution? I know this is the Croc Blog, but pictures of other taxa (particularly of the reptilian persuasion) are always appreciated! Yes, mtDNA sequencing. Population size we should get a better idea of from the spotlight surveys, although it will require some extrapolating because we can't cover all possible creeks. Extent is not entirely known but there are likely other populations. And yes, pictures of other taxa are coming in the next update. It's quite a menagerie up here. Do the pygmy crocs show other morphological differences, apart from their small size? Not at first glance, although I suspect there may be allometric differences particularly in larger individuals. It's one thing we're looking at, although you really need a large sample size to start shedding light on those questions. 65 million years after the dinosaurs suffered a slight setback, the most successful archosaurs - the crocodilians - are still with us. Whether you regard yourself as a crocophile, a curious bystander, or prey, you owe it to yourself to learn more about the most successful semi-aquatic predators of all time, and perhaps a little about those who work with them. I'm a zoologist specialising in crocodiles, whether it's research, management, conservation or film-making. 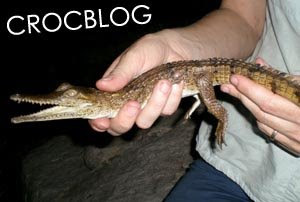 I run the popular website crocodilian.com and a consultancy business called Big Gecko with my wife Erin.